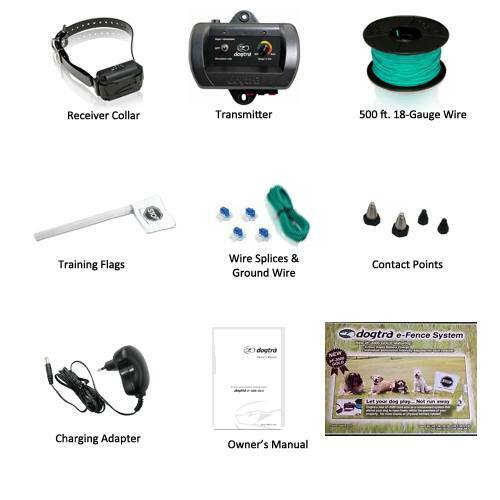 EF-3000 Dogtra Fence System | Free Shipping! 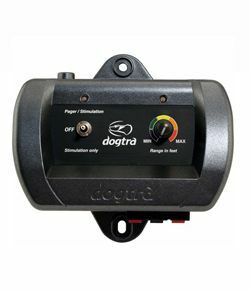 The Dogtra Gold is a reliable and sturdy fully featured system, if a bit dated. Both are bulky and a bit rough – missing the sleek lines and contoured shapes of the newer systems. The collar is more cumbersome than we’d like. Dogtra says it’s suitable for dogs 10 lbs. 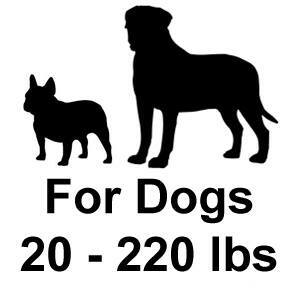 and up but we find that it’s too big for most dogs under 20 lbs. ; On the upside, it is waterproof and rechargeable. Additionally, it allows for individual correction levels for each dog on the system making it a good choice for multi-dog households where the dogs are of very different sizes or temperaments and need customized correction level settings. With a capacity of up to 40 acres, the system can handle a larger property than it’s closest competitors and it includes the slightly heavier 18-gauge wire as opposed to the 20-gauge that most systems include. Individual Correction Levels: The biggest asset of the Dogtra Gold is the ability to customize the correction level for each dog on the system right on the collar. The level selection is a simple turn dial that does not require any coin or tool. Rechargeable: One of our favorite features of any dog collar is the ability to recharge and avoid the hassle of buying and replacing batteries. The Dogtra collar comes with an adapter that plugs into a port on the collar. The lithium polymer battery takes two hours to charge and holds the charge for about 3 weeks. Includes Short & Long Contact Points: The Dogtra Gold EF-3000 comes standard with long, short, and training prongs. The training prongs do not conduct a static correction so they’re great for getting the dog used to the feel of the collar during the early stages of training when the correction is not yet appropriate. The long prongs are for long-haired dogs and the short for short haired. Warning Tone and Vibration: The Dogtra Gold collar utilizes vibration in addition to the audible warning tone when the dog is approaching the boundary. This is a great feature for elderly dogs, those that don’t hear well, or those that just need that extra attention-getter. Big, Bulky Collar: The Dogtra EF-3000 Fence Collar is on the larger side. It's a chunky, brick of a receiver that is too big for dogs under about 20 lbs. On medium to large dogs it's not an issue and is very durable even for dogs who play rough. 40 Acre Capacity: The Dogtra transmitter is one of the more powerful. With a capacity of 40 acres, this system is more powerful than most of it's competitors. More than suitable for suburban yards and even powerful enough for most big rural properties, the Dogtra has no problem with space. Adjustable Signal Field Width: The dial on the control box allows you to set the width of the correction zone. The dial goes from “min.” to “max” but does not show distances. This is irritating but you can still get an accurate boundary distance by taking the collar out to the perimeter listening for the warning beep and then measuring your distance from the wire. 18-Gauge Wire Included: Unlike most dog fence systems, Dogtra includes 500 ft. of 18-gauge wire instead of the thinner 20-gauge that is standard. Even 18-gauge wire is too thin for most installations and we recommend upgrading to 14-gauge wire to save yourself from future wire breaks. Collar Strap Fits Necks: Up to 26"
The Dogtra gold has the power to cover upto 40 acres and comes with a rechargeable battery. The best thing about the system is the full 2 year warranty. The only problem with this system that I have found is that the collar is a bit too big but aside from that all is well and it was overall a good buy. The choice I made in buying this system has proved to be the correct one every day that I put it to use for me and my pets. A Huge Thanks to Flexpetz. I bought this product a while ago and to be completely honest I used it for about 6 months but It was very happy it had helped to my situation.